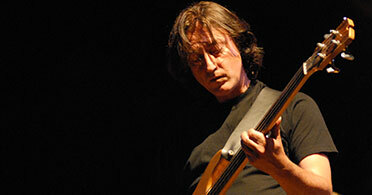 As a Bass player Alan was another long-term member of John Martyn’s Band and an accomplished song-writer. His touring and writing credits include Robert Palmer, Rick Wakeman, Andy Summers, Bo Diddley, Denny Laine and Long John Baldry, John Jorgenson & Jacqui McShee's Pentangle. Starting out playing guitar for The Arthur Trout Band (1976–1980), he then switched to fretless bass guitar and was invited to work with John Martyn, Alan toured and recorded with John until Martyn's death in 2009. While working with Yahama, a meeting with Jerry Donaghue (Hellecasters, Fairport Convention) led to Thomson joining the Backroom Boys along with Doug Morter and a subsequent invite to join the Hellecasters in 1987, and then to touring with John Jorgenson's Electric Band (1997 – present). In 1998, an offshoot from The Backroom Boys gave birth to Then Came The Wheel, which continues to tour UK, Scandinavia and Ireland. He currently tours and records with Jacqui McShee's Pentangle (since 1997), John Jorgenson's Electric Band, Rev Doc and The Congregation and Then Came The Wheel.